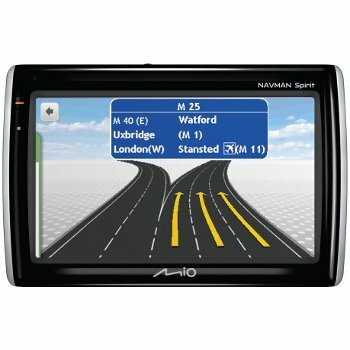 To celebrate our relaunch, we are giving away a fantastic Mio s500 satellite Navigation system. All you have to do is comment on this post, telling us why you want the sat nav and where the first place you’d go with it would be. The best comment wins! All entries must be submitted before 4st June 2010 – Winners will be announced on Monday 7th June 2010. To tie-in with this summer’s football, Mio is giving away a host of exciting prizes. Firstly, for your chance to be part of the action, Mio is offering a lucky winner two tickets for a top European football game next season. To be the envy of your friends left at home, simply visit the mio.com/football website and register your purchase when you buy a Mio Spirit TV. You’ll then be automatically entered into the prize draw and could soon be on your way to watch a major European match. The prize package includes four star hotel accommodation, flights, transfers and match tickets for the winner and a friend. And for a limited time only, save an incredible £30 when you buy TV products from the Mio range (available with selected retailers). I used to have a Sat Nav but it was really unreliable (I’m talking taking you through fields or towards a river lol. So I rolled back to a paper map which my OH thinks is HILARIOUS! I would love to win the Sat Nav because a road trip with me involves getting lost at least once if not twice lol. I’d love a SatNav so I can find out where I am and maybe I’ll get somewhere in life. I’d like to win the sat nav cause it beats using maps for long trips and the first place i’d go g go is TX (I live in CA) to visit my grandparents, aunts & cousins! I want the sat nav because I’m looking for direction (seriously, I have no natural sense of it at all!). The first place I would probably try to go is Halfords so I could ask them to show me how to use it! I’d like a satnav because the last time I went on a trip without one, I accidentally found myself in Salinas, California, famed hometown of John Steinbeck. I then spent the next several hours contemplating the real meaning of “Grapes of Wrath” as I wandered aimlessly along a series of dirt roads which took me deeper and deeper into fields that may or may not have been where George shot Lenny. Eventually, through the use of a makeshift sextant cobbled together from the remains of a McDonald’s coffee cup lid and an old pair of sunglasses, I located a freeway, narrowly escaping the dust bowl with my life. If I had a satnav, such experiences might be avoided. I want a sat nav, so i can take a road trip through europe onto a ferry and explore my home land Egypt! go down past the nile – working my way through my ancient mother land! Wonder if it has the directions to the rest of King tuts treasure hmmm… Oh and i guess it will come in use when im here in the UK! I want a sat nav as I have a terrible sense of direction! I used to work as a estate agent and had to drive my brand new company car from Acton to Camden. The drive should of took 45mins max down the A40 but 4 hours later… and many turns, round about and pull overs I ended up in… HEATHROW. I only worked as a estate agent for 4 months, and quit on the basis that I despite I was great my job I couldn’t read maps so spent more hours driving aimlessly lost in St Johns Wood and Central London. I would like to win the sat nav as I am travelling across Africa for charity and don’t fancy getting lost in the African wilderness and being eaten by a lion. I would love to win this sat nav as we are moving soon and I will be negotiating country roads and getting lost, with this the world would be my lobster! I would like to win the sat nav as I love gadgets. My mobile phone gives me sat nav but unfortunately it runs the battery down way too fast which makes it unusable! Living in the country means I use the back roads a lot and being lost at midnight [trying to get to a function which started at 8pm!] in fog, down roads which don’t seem to have any names, is not fun!! Gadgets for the win! I’d like to go to Scotland to see all the sights and avoid all the frights.